My husband loves Indian cuisine, he could eat it every single day. I have to be in a mood for it even just to make it. When the Pioneer Woman posted a recipe for butter chicken, one of the husband’s favorites, I knew I had to make it at home. It was at this stage of the cooking process that got me thinking…how can I turn this into a soup? I love making soups, stews and chili in the fall and winter. They’re hearty, can be filled with veggies (yes, even chili) and they’re pretty easy to make. 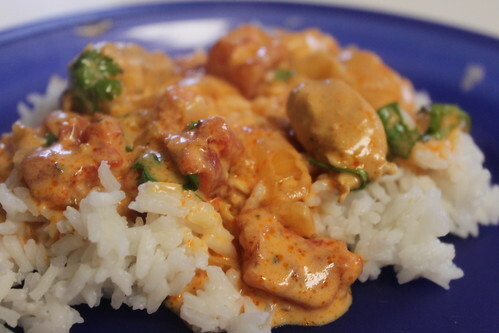 Butter chicken has to marinate overnight and a lot of times I’m not thinking that far in advance as to what I want to cook, so it’s an inconvenience. 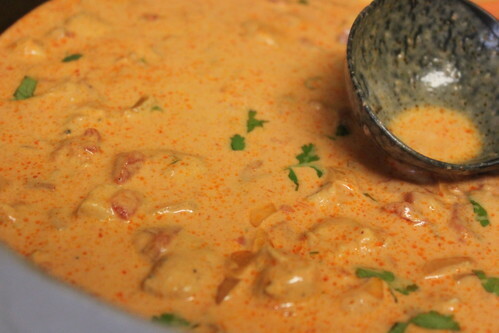 But why can’t I adapt a recipe for a creamy tomato soup and use the same spices that were in the butter chicken?! My husband even took this creamy broth like base of the dish and ate it like a soup with breadsticks. I think I need to really look at the spices, the cream and figure out how to make this a full on soup because then I wouldn’t have to worry about it marinating overnight. I’ll update, once I successfully make this dish. And today is Tumblr Tuesday, click here to recommend me so I can be added to their directory! Please and thank you.